Aug. 28, 2008 -- Arkansas State University will partner with the Smithsonian National Museum of American History and its partner, the University of Texas-El Paso, to host a series of collection days throughout Arkansas to record oral histories as part of the Bracero History Project, a consortium of museums, universities and cultural institutions, including the National Museum of American History, the Institute of Oral History at the University of Texas at El Paso, the Center for History and New Media at George Mason University, Brown University, and ASU. ASU’s participation in this project is due to its position as the major university in the Arkansas Delta, its Ph.D. program in Heritage Studies, with its focus on the region, and its rich archives. The Archives and Special Collections at ASU’s Dean B. Ellis Library includes the papers of Congressman E.C. “Took” Gathings, who served in the U. S. Congress during the bracero program and was involved in legislative and practical matters concerning the program. 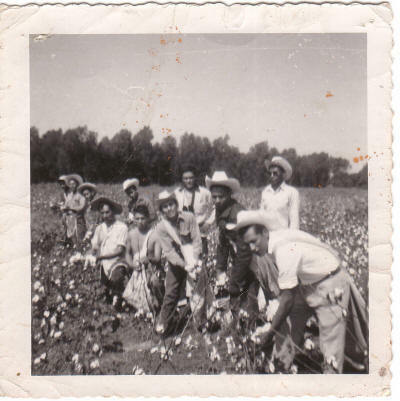 ASU’s oral history project, “The Arkansas Delta in Transition,” has already collected several oral history interviews related to the bracero program. Dr. Brady Banta, associate director of ASU’s Heritage Studies Ph.D. program and archivist of ASU’s Dean B. Ellis Library, says, “These interviews sparked our interest in documenting the agricultural labor arrangements employed during the transition from sharecropping and tenant farming to the development of the mechanized and scientific agriculture that we see around us today. The Bracero History Project seeks to preserve and collect the history of the guest worker program, the bracero program, that resulted from an agreement between the United States and Mexico from 1942-1964. In Spanish, “bracero” means worker or laborer, and has its roots in the Spanish word for arm, “brazo.” The bracero program literally brought in extra pairs of arms to perform manual labor. The oral histories and some of the relevant objects collected by ASU will be added to the Bracero History Archive (BHA), an archive of sound files, transcripts of interviews, photographs, documents, and other items of interest. In 1942, the U.S. and Mexico entered into a series of agreements to organize a program of mutual benefit. The U.S. was experiencing a labor shortage due to World War II, and the bracero program allowed Mexican citizens to work in the U.S. legally as temporary contracted labor, largely in the field of agriculture. More than four million Mexican men entered the U.S. to work, initially in California and Texas, but spilling into the Arkansas Delta by 1948. At one point during the program’s lifespan, some 25 per cent of cotton labor in the Arkansas Delta was Mexican. The addition of bracero labor had a significant impact upon the region’s black and white tenant farmers and day laborers—the bracero labor force had an influence upon Arkansas’ agricultural economy, its industrial technology, and its culture. The Mexican government established a consulate in Memphis to monitor the conditions of braceros on farms, and constant conflict ensued between the consulate and the farmers who recruited, worked, and housed braceros. In the early 1960s, mechanical cotton pickers became more common, and the number of braceros, as well as other field laborers, declined. The main week of interviewing will take place in various locales in Arkansas during the week of Sept. 22-26. The project seeks to collect at least 25 oral history interviews, collect relevant objects for the Bracero History Archives, and educate local communities about the history of the bracero program in Arkansas. Since few, if any, former braceros remain in the region, the project will focus on farmers, African American tenant farmers who hired braceros, white and African American laborers who worked alongside braceros, and/or were affected by the bracero presence. In addition, the project will also focus on merchants, store clerks, other business people, such as insurance agents and bankers, and professionals like doctors and dentists in towns frequented by braceros. Relevant objects sought include period hand tools, clothing, photographs, and documents including contracts, identification cards, and letters. For more information about the Bracero History Project, visit www.braceroarchive.org. To schedule an interview, call Dr. Brady Banta at (870) 972-2612, or e-mail him at bbanta@astate.edu. Photo above: Braceros pick cotton in Arkansas. Photo courtesy of the University of Texas El Paso, Institute of Oral History.